TimePanic is a time tracking application for anyone who works on a computer. Individuals will appreciate the ease of use and the availability of a freeware edition. Self-employed people are more likely to need the hourly rates, including the possibility to calculate net invoice amounts, and they might want to go for the portable version of TimePanic that runs on USB pen drives. Small businesses have the option to use TimePanic in a team, at no extra cost than the per-user licenses. This includes the capability to run multi-user reports and involves surprisingly little administrative overhead. Finally, employees who are being tormented by clunky corporate time tracking systems can use TimePanic on an individual basis to calculate their overtime and to track their leave. Half and quarter days of leave are supported. TimePanic is particularly good at tracking your hours in real time, as opposed to writing them down from memory at the end of the day or the week. With only two mouse clicks, you can track a task switch in TimePanic at the very moment it happens. This saves you from the hassle of manual time entry, and along the way, your timesheets will become so accurate that your customers will not even think of questioning them. Hourly rates can be flexible and, for example, vary with the time of the day or the day of the week. Sub-projects can use different hourly rates than their parent projects. Reports include the capability to print, search and export data and are saved in a standard document format for further processing and printing by third-party applications should the need arise. 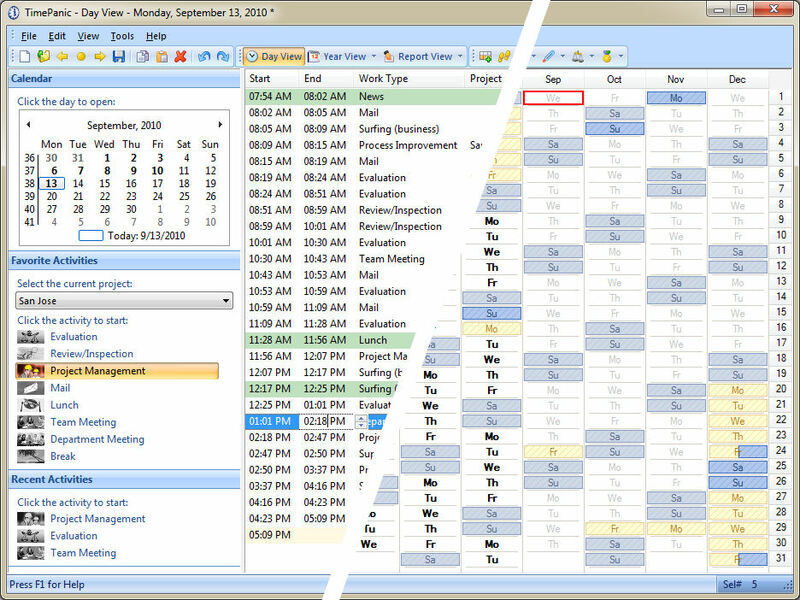 Exported time tracking data can be easily imported into Microsoft Excel. The favorite reports feature lets you, for example, create a monthly report and set it to always use the data of the previous month. Every time a new month begins, you can reuse this report with a simple mouse click to obtain a summary of the last month. TimePanic is available in English & German.